...Mother nature will take back what is hers. I've had this idea for a very long time. The challenge was perfect! Set-up is simple and obvious. I did end up taping a lot of the Boston Ivy to the stump...and to the hatchet for that matter. There are 7 little petunia flowers also in there which are difficult to see due to the infrared. The hatchet represents mankind, the ivy represents Earth, and the flowers represent nature thriving and continuing reproduction while (gently, in a way) taking back and overgrowing mankind. Why a hatchet? The continual violence towards the earth that is exhibited by humans everyday. The hatchet is stabbing the stump, yet it needs the stump to stay aloft. It's hurting the stump, and yet the stump is still supporting it, even in death. Physically and literally, everything that is dead here is dark and everything that is alive here is white. The hatchet is "dead" because of how the human race has disconnected from the earth. The stump is "dead" because of the abuse humans have afflicted upon it. The ivy and flowers are alive and represent new growth and life. I tried to add the idea of cycles in this also. 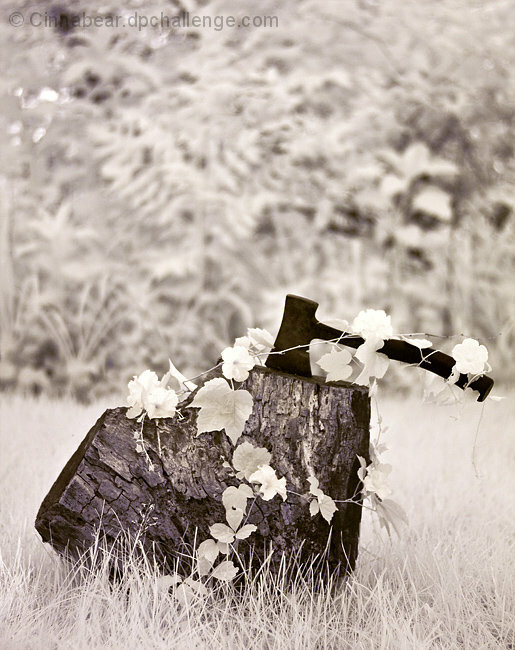 The ivy grows around the stump and around the handle of the hatchet. The tones of yellow and blue represent the sun and moon to me: again, the cycle of day and night. Even though there is great abuse afflicted on the earth, the earth can still rebound. There are cycles of dark and light in Earth's past, and this current time is just a part of the cycle. The tones are so peaceful in this. I am using the word peaceful in a photograph that has an axe in it so in a way it is an oxymoron. Should have done much better. A wonderful image! I don't quite understand the symbolism in this image... With that put aside, I don't hate the image itself but I think it's definitely washed out and needs a contrast bump. I liked how peaceful this was. Great composition. This is my favorite entry, hands down! I like this picture, but I don't understand what it's saying, I guess. When we're gone... What? What happens when we're gone? I can't put an ending to it. Neat picture, though. Proudly hosted by Sargasso Networks. Current Server Time: 04/20/2019 06:35:54 PM EDT.